Renovated barn with its own garden situated an hour from the port at Caen and 2 hours from Le Harve, set on the edge of the village of Taillebois in the heart of The Suisse Normandie Region. The barn has 706 SQ/FEET LIVING ACCOMODATION WITH, 3 bedrooms, the vaulted bedroom has had added for 2019 its own private toilet and hand basin enclosed in the room, The bathroom has a bath/ shower, hand basin ,w/c and storage cupboard. The downstairs a large open plan kitchen/dining/lounge area and separate laundry room, all rooms are heated by electric convectors for all year round holidays. An ideal position to reach many attractions, historic monuments,There is also the opportunity to try out one of the many local activities - kayaking, horse riding, mountain biking, golf and walking with (29 local routes) mostly tree lined. Climb among the trees at the nearby Roche d'Oetre tree adventure park, not for the faint hearted. For the less energetic just sit back, relax and listen to the woodpeckers and other wildlife in the woodlands around us. We live here in Taillebois all year round and have three children who love the freedom they have and the french way of life. As with most french families we have chickens , along with 2 adorable goats and guinea pigs. There is very little traffic on our roads and we all love to go bike riding down the numerous lanes and cycleways. Everyone here has made us so welcome and the french are so helpful. We originally started looking for a holiday home but fell in love with the area and decided to get out of the hussle and bussle of England and now live a much slower pace of life. the gite is in a converted barn across from the courtyard from where we live so it is private but we are on hand should you need anything. Bath with overhead shower, WC and pedestal basin (heated with an electric radiator). we have up too 2gb speed max as in the countryside. electric cooker with hob, under worktop fridge with small freezer compartment ,kettle, toaster and coffee maker , all plates dishes, pots and pans and all utensils . Well-equipped and spacious house in quiet rural setting with private and attractive outdoor space. Friendly English hosts with plenty of ideas and tips for the area. This part of Northern France, 'La Suisse Normandie', is ideal for walking, river activities and mountain/road cycling. Also within reach of D-day beaches, Bayeux, local markets & charming small towns. We had a pleasant four days at Dennis and Tina's property. It was very clean and comfortable and we were made very welcome by the family.The countryside around was very pretty and we were well situated to see Falaise, Bayeux and The Normandy Beaches. it was a pity about the weather but that could not have been helped. 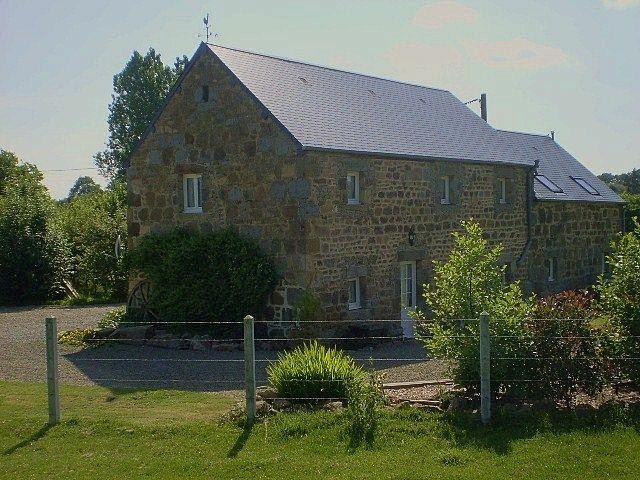 Wonderful French country farm house with everything we needed! Dennis and Tina are amazing hosts! They gave us great directions to the home and had everything ready for our arrival. They even hand picked DVDs for our kids to watch. We arrived in the evening and we're greater by Tina, who asked if we needed anything and then left us to settle for the night. The house was cozy but accommodated 4 adults and 3 children very comfortably. The furniture is comfortable as are the beds (2 double and 3 twin). Kitchen is fully equipped and we prepared several meals with no problems. There is only one bathroom but we never had an issue with this. The location may be too remote for some but we enjoyed being in the country. The sites of Normandy and D-day are all within an easy drive for day trips. As the house is rural, the Internet is hit and miss but this didn't bother us. We had a wonderful stay and enjoyed the warm hospitality of our amazing hosts! We would definitely stay again and recommend to anyone who loves being in the country but with plenty to explore nearby. Had a wonderful short stay in this relaxing rural retreat, in this beautiful part of France with lots to discover nearby. We were greeted by Tina and Dennis who were great hosts full of local knowledge and always on hand if anything was needed. Our kids loved playing in the garden and visiting the goats and Donkeys. Would love to visit again. Rural location, very quiet local roads perfect for walking or cycling. Cottage very clean and well equipped. Owners Tina and Dennis live close by and on hand for any questions/queries. Very helpful. English TV on freesat, plus English dvds/books should you want. We enjoyed just chilling out on the sun loungers with a book and a glass of wine if not out and about. The sandy Normandy Landing Beaches are one hours drive away. The port of Caen (Ouistreham) is about 1 hours drive. Port of Le Harve is about 2 hours drive. Dieppe about 2 3/4 hours drive. Calais about 4 hours drive. Nearest large supermarket is at Athis (10 mins) which also has a Tourist Office, bank, several independent shops. Nearest sreet markets are held at Flers (20 mins drive) on Wed and Sat and Conde-sur Noireau on Thursday (20 mins drive). Falaise with its outstanding castle and ancient churches, Clecy, The Suisse Normandie countryside, Roche d'Oetre tree adventure park with amazing views and Pont D'Ouilly nestling on the river are but a few of the many places to visit. Booking Notes: Changeover Day: Saturday changeover in the high season but more flexibility is available at other times. Arrival should be after 4.00 p.m. and departure by 10.00 a.m. but please ask and we will do our best to accommodate you Notes on prices: A supplement of £25 per week will be added from 1 October through to 30 April for heating costs. A security deposit of £100.00 will be added to final balance (this will be returned after departure less any deductions for excessive cleaning and/or damages).